Going back to work after a long and relaxing holiday can be excruciating. Especially if you have spent the last 10 days sleeping until 10 in the morning. How are you to go back to your routine schedule and try to wake up at 7!? My best solution to a pain like this is a hearty and energetic breakfast which will wake you up and keep you on your toes for the remainder of the day. To make this dish even heartier, you can serve it with whole wheat bread and walnuts. In a large bowl whisk together the eggs, milk, and salt. Set aside. 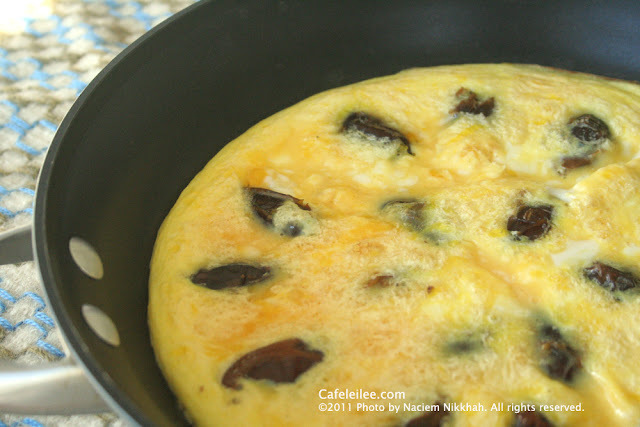 Arrange the date halves, cut side down, in the skillet, and slowly pour the egg mixture around them. Cover and let the omelet cook for 5 to 10 minutes. If you realize that the bottom of the omelet is beginning to brown but the top is still runny, place the pan under the broiler for about 2 minutes until it is set. اگر محبوبترین صبحانه من تو تابستان املت گوجه فرنگی باشه، محبوبترین صبحانه زمستان ها هم املت خرما هست. املت خرما میتونه خودش یک غذای کامل باشه ولی به عنوان صبحانه قبل از شروع یک روز شلوغ و پر مشغله هم خیلی میچسبه. تنها چیزی که میتونه این صبحانه رو کامل تر از اینی که هست بکنه سرو کردنش با نان سنگک و گردو هست. کره را در یک تابه بزرگ آب کنید. توی یک کاسه بزرگ تخم مرغ ها را بشکنید و با شیر و نمک خوب بزنید.